Extreme conflict can come in numerous different forms. Relationships, environmental, and self conflict can all be very hard to overcome. That is not the least of them. Environmental can be life changing, scaring and life threatening. Relationships are something every human will form, some may mean more then others, yet you value each one differently. Self conflict can be presented and taken different ways, conflict with someone else can do serious harm on you emotions. Conflict between thoughts sound easy to over come, yet you still have them floating around constantly. You may be able to overcome some extreme conflicts, not all, but by finding a source to talk about the conflicts can seriously help take some pressure off you. Looking for a form of exercise or a new hobby to take your mind of of it can result in time away from the problems. Seeking a conclusion may help you as every story must come to an end and knowing the end can help you close the book. Take the time, you may find something you believe in strongly, a god like figure, and asking for forgiveness, patients, help, the answer and so many more can help you bust that wall down. Some people may turn to magazines or books for relationship advice. You see the forest fires that were on TV, the communities that came together to help one another find some kind of happiness. You need to seek what you believe may help. What will you find that helps you over come conflict? How does it help you? Why? 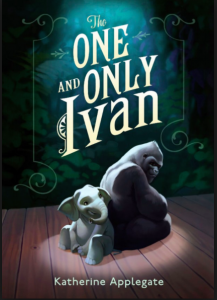 A source that can help you overcome extreme conflict is the book “The One and Only Ivan”, I refer to this book a lot as it tells so much. To overcome his conflict Ivan found friendship, a hobby and a love connection.